Πρόσφατα ανακαινισμένο, η ιδιοκτησία διαθέτει παραδοσιακή κυκλαδίτικη αρχιτεκτονική, διάσημη για τη μοναδικότητα και τη γοητεία της. Βρίσκεται σε μικρή απόσταση με τα πόδια από την πρωτεύουσα του νησιού, όπου μπορείτε να βρείτε πολλά καταστήματα, εστιατόρια, μπαρ και μουσεία, καθώς και μια εύκολη διαδρομή προς τους εξαιρετικούς αρχαιολογικούς χώρους και τις εκπληκτικές παραλίες της Σαντορίνης. Το νησί έχει σχήμα ημισελήνου με το ακίνητο που βρίσκεται στη μέση του. Έτσι, η τοποθεσία του Sea Horse Residence δίνει στους επισκέπτες του την ευκαιρία να θαυμάσουν την θέα της Καλντέρας σε όλο το πλάτος της, από το χωριό της Οίας μέχρι το Ακρωτήρι και το ηφαίστειο. Σε οποιαδήποτε στιγμή της ημέρας, το φως και τα χρώματα δημιουργούν εκπληκτική θέα που εμπνέει τον ενθουσιασμό και το δέος που κάνουν τη διαμονή του επισκέπτη μια αξέχαστη εμπειρία. Ο χώρος μας μπορεί να φιλοξενήσει έως και 8 άτομα για γάμους, ανανεώσεις όρκων, επετείους, εργαστήρια ή απλώς για οικογενειακές διακοπές ή διακοπές φίλων όπου μπορείτε να απολαύσετε την αποκλειστική χρήση της κατοικίας. Σχεδόν κάθε είδος υπηρεσίας που απαιτείται μπορεί να παρέχεται. Η κατοικία είναι χτισμένη σε τρία επίπεδα. Η βίλα έχει τη δυνατότητα να φιλοξενήσει μέχρι 8 άτομα. • Δίκλινο δωμάτιο με ιδιωτικό μπάνιο (ντους). Όλες οι περιοχές της κατοικίας έχουν θέα στην Καλντέρα και το περίφημο ηλιοβασίλεμα της Σαντορίνης. Η κατοικία είναι ανοιχτή όλο το χρόνο. The villa was as good if not better than the pictures. The views and sunset were spectacular and the outside of the villa seems like a tourist spot to watch the sunset. The service from the team starting with Chantal and including Tonya, Costos, Athena and the rest was outstanding and every request was not only catered too but they went out of their way to make our stay feel like royalty. We were a large group of 6 adults and 3 kids and would highly recommend this property. Our family of seven, including three adult children and two spouses, spent five nights at Seahorse on Santorini. Though we have traveled extensively, this was one of the most extraordinary travel experiences any of us have enjoyed. Seahorse villa is tucked into the beautiful rock hillside of Firastefani, away from the hustle and bustle of Fira. It includes four levels of comfort, with each bedroom having its own ensuite bathroom. The main gathering place for your family is a deck and hot tub overlooking the Aegean Sea and Santorini's spectacular caldera. The view is west-facing, so you will see extraordinary sunsets daily! The villa is very comfortable and well cared-for, exceeded in quality only by the service provided by Chantal and her team: quiet, understated, perfect. Each morning at the time you select, a beautiful Greek breakfast is served including Greek yogurt, fresh fruits and breads and another dish. The team who prepare and serve the breakfast have it ready at precisely the time you select and then disappear so you can enjoy your morning repast in privacy. Several bedrooms have ensuite coffeemakers in case you rise early. During the day, other members of the team provide fresh linens, empty trash, refresh water so that things are always ready when you return to the villa. The location of the villa is ideal from a number of perspectives. Fira is the main place tourists enter the island from cruise ships and can be incredibly busy. Although some of them come to Firastefani, it is a 15-minute walk so foot traffic is not as intense. Yet, it is easy to walk into Fira or Firastefani for dinner after the cruise ships leave; there are literally dozens of restaurants within easy walking distance. The hike from the villa to Oia took us a little less than three hours and is spectacular. It is also an easy cab ride to Oia if you want to explore less rigorously. Chantal helped us arrange a half-day catamaran cruise and a van rental for four days so we could explore the island. There are numerous vineyards to visit, the Donkey brewery, archeological sites, beaches and the beautiful village of Pyrgos. The well-known hike from Fira to Oia is a wonderful activity for early morning before it gets to hot. Every place on the caldera side of Santorini has a beautiful view, but none more special than at Seahorse. Our time at Seahorse was memorable. There is nothing I would change about the experience! We had a group of 8 stay at Seahorse Residence for 4 nights. The apartments were exactly as we expected and couldn't have been more perfect. The views are absolutely stunning. Chantal was the perfect host and went out of her way to make our stay exceptional. Our last night was a particularly memorable experience. We had dinner prepared by the private chefs, Xenophon and Athena. It was exceptional and a perfect conclusion to our stay at Seahorse Residence. The breakfast each morning was also delicious and such a nice surprise to find what they had prepared for us. This is the perfect place to stay in Santorini and we will cherish the memories from this vacation in Greece! 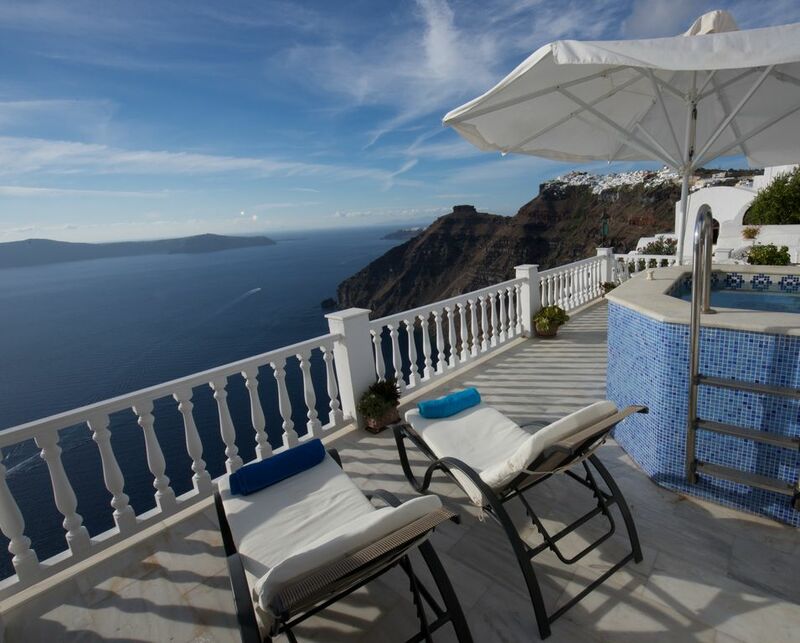 Great villa with an amazing caldera view! The villa is centrally located, quiet, clean, functional and features an incredible view of the volcanoes. Pictures can not do this view justice. Chantal is a first class host. She was incredibly welcoming and helpful throughout our stay. Anything we needed day or night she took care of it. She made dinner reservations and got us the best table. She recommended a semi-private, sunset sail around the island and took care of all the logistics (I highly recommend this). Having breakfast served at the villa was a great way to start the day. I highly recommend the Sea Horse Villa for your stay on Santorini. If ever you want to stay in Santorini, you cannot go wrong with the seahorse villas. From multi family to small party to couples. Great location and service.